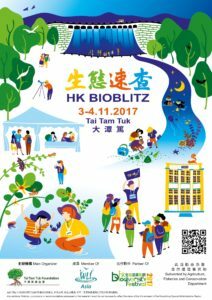 Over 24 hours on 3-4 November 2017, Tai Tam Tuk, the smallest mangrove in Hong Kong, will host the second Hong Kong BioBlitz: a collaborative citizen science event where public, expert naturalists and volunteers race to to identify as many species of wildlife as possible! This event is organised by Tai Tam Tuk Eco Education Centre with many generous and enthusiastic partners to support Hong Kong’s first Biodiversity Strategy and Action Plan (BSAP) 2016-2021. We also have a very special visitor for the event, Dr Jim Flegg and his wife Caroline. Jim is well known to birders as presenter of BBC’s Bird of the Week, and former head of the British Trust for Ornithology. What is little known is that he was born in Hong Kong, 80 years ago this year. His childhood home in Tai Tam Tuk is now a Declared Monument, and will also serve as our event Basecamp hosting mini-exhibitions, ID zone with microscopes and guides, and children’s activities- not leaving out the youngest naturalists! For friends of wetlands who enjoy the challenge of species identification, join us on iNaturalist to help confirm wildlife records, whether you are in Hong Kong, Asia, or further afield.